This month in the office, we’ve been discussing all things comfort food - what our ultimate indulgence is once the weather gets a little colder. It’s a scenario I’m sure we all associate something with - the one thing we want once we get home after a particularly blustery commute or how we indulge in the comfort of a warm home on a weekend when the rain simply won’t let off. As a team linked by our love for food, our idea of the ultimate winter comforter are starkly different - from blow out brunches to simple soups inspired by home, so over the winter we’ll be sharing a few of our favourites. Kicking things off this week with indulgence - the brunch to beat all brunches, e.g. what to do when it’s too cold and rainy to get to your local weekend spot. It’s excessive in the best form - gluten, wheat, dairy and ‘refined-sugar’ free but you absolutely wouldn’t guess it. And whilst we have a lot of time for waffles, we understand not everyone is an avid kitchen gadget obsessive like us, so it also makes a great pancake batter (a great carrier for all the toppings either way). Add the water to a large pan and bring to a boil. Meanwhile, peel the pears until all the skin has been removed. Add all the ingredients to a blender and blend until a smooth paste has formed. Add more liquid if necessary. In a large bowl, mix together the dry ingredients (oat flour, baking powder, salt and cinnamon). In another bowl, whisk together the wet ingredients (milk, melted coconut oil, eggs, maple syrup and vanilla extract). Pour the wet ingredients into the dry ingredients. Stir until combined. At this point the batter will still be very runny, let the batter rest for 10 minutes so the oat flour can soak up the moisture. Plug in your waffle iron to preheat now. If you're making pancakes instead, heat a pan with a little coconut oil instead. Once 10 minutes is up, give the batter another stir. Pour the batter onto the heated waffle iron, enough to cover the center and most of the central surface area, and close the lid (or, for pancakes, into the pan 1/4 cup at a time). 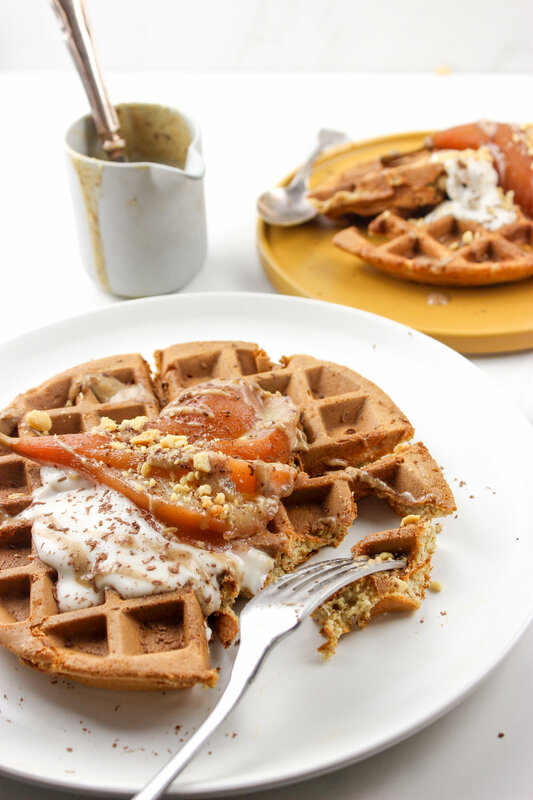 Once the waffle is deeply golden and crisp (about 5-7 minutes but every waffle maker differs! ), transfer it to a cooling rack or baking sheet and pop in a low heated oven to keep warm. Serve one waffle per person, then top with dairy free yogurt (we used nush), a poached pear, date caramel, salted peanuts and dark chocolate shavings. Enjoy!